We’re sure that all pet owners would love to have the luxury to pamper their pets with no expense spared indulgence. The comfiest of beds, all the toys and the newest and most organic shampoos available. However, the fact that many pet owners have a budget that must be stuck to doesn’t necessarily mean you have to cut corners when it comes to keeping your furry best friends clean. 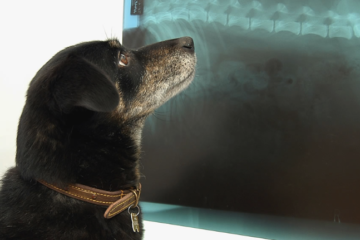 Indeed, cutting too many corners can lead to more significant problems for your pet further down the road. For instance, merely substituting human shampoo for dog shampoo will not cut it. The composition of human shampoo may cause irritation and a host of skin problems that will require even more products to cure. These potential risks mean if you do have a budget to stick to it is necessary to pick the best cheap dog shampoo on the market today. Choosing the right cheap dog shampoo for your dog first involves finding out which brands meet your pet’s specific hygiene needs. Is it hypoallergenic? Does it need to mask a pungent lingering odor? Besides this, a good brand also requires a lot of products to lather up. It’s also important to find a product, which is easy to rinse to keep bath times quick. These are just some of the considerations that need to be made when it comes to choosing the best value dog shampoo for your pet. That being said, shelling out a few bucks extra if needed for a dog shampoo that delivers perfect results shouldn’t be ruled out straight away. With a balance of quality and price in mind, here are five dog shampoos that can be purchased for less than $5. Perfect Coat Gentle Hypoallergenic Dog Shampoo is ideal for owners who aren’t too keen on fragrance and instead prefer unscented shampoos. This product does away with the strong dyes and scents in its attempt to deliver a hypoallergenic product for dogs with sensitive skin and allergies. What it lacks in aroma, it more than makes up for in results. The shampoo leaves your pet fresh and clean-smelling while maintaining a healthy and glossy skin and coat. The product rinses off rather quickly during baths, a result of Perfect Coat’s formula that prevents shampoo solids from setting on the coat. This is especially handy for owners of large dogs and can make quick work of any bath. The main drawback, however, is that the product seems to work well mainly for dogs with thick, furry coats. We found that using it on dogs with sparser coats can lead to dry skin. Likewise, some of its ingredients, such as cocamidopropyl betaine, are known irritants and can cause mild discomfort for people susceptible to contact dermatitis. In spite of its name, Hartz Groomer’s Best Puppy Shampoo is ideal for dogs of all ages. It works exceptionally well for dogs with sensitive skins and coats. This is due to its mild formula being designed for the sensitive skin of young puppies. It also incorporates a no-tear formula, which is gentle should it get in your dog’s eyes. The gentle formula doesn’t just minimize itching but also means there shouldn’t be much trouble when the finicky pups having their first baths attempt to lick away the shampoo. It also rinses rather well and leaves behind little residue, making quick work of bath times for those with very hyperactive dogs. The relative mildness of the product, coupled with its somewhat runny consistency, means that the owners may end up using more of it than they need to. Also, its otherwise pleasant jasmine scent isn’t that strong and leaves a lot to be desired, especially for owners of dogs with slightly pungent smells. Available in 18-ounce bottles, the product is comparatively inexpensive in contrast to others. 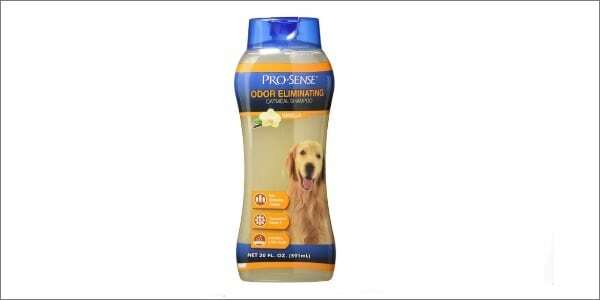 Derived from natural ingredients, Pro-Sense Oatmeal Shampoo offers to eliminate strong pet odors while promoting better coat shine and skin health. Key ingredients are panthenol and chamomile. In general, we found the brand to be less aggressive than others we have trialed which fall within this price range. It is also safe to use on dogs with particularly sensitive skin and includes a useful moisturizer, which we found reduced itching within the first few uses of the product. A key issue is its advertised vanilla scent. Ideally mild and relatively inoffensive to some dog owners, the aroma is not that pungent and does not linger too long on the dog, thus coming off as slightly underwhelming for others, especially for the owners of exceptionally smelly dogs. Another issue we saw was its lather. In some cases, it takes a lot of product to get a generous lather going. 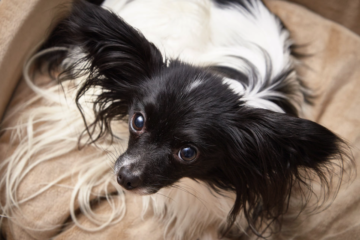 It is also quite difficult to spread around due to its consistency which may mean owners of small yet hairy dogs seem to go through the 20 oz. bottles quickly however for the price even purchasing two bottles a month can work out more cost-effective than other dog shampoos available. AvoDerm’s Natural Oatmeal Formula Shampoo for Dogs and Cats attempts to bridge the species barrier, offering a mix of avocado extract and other healthful ingredients to promote better skin health in both canines and felines. The shampoo possesses a clean and pleasant smell and does an excellent job of eliminating the familiar wet dog smell, though some may find it overpowering. It does short work of oily and dirty coats and also possesses a soothing formula, which can help minimize irritation. It also controls excess shedding in unusually thick-furred cats and dogs. AvoDerm Natural Oatmeal Formula Shampoo for Dogs and Cats does remove a lot of oil from the fur, removing some of the shine, but retaining a pleasant texture. Thus, it works best alongside a conditioner, which can make it a lot pricier to use. We did take slight issue with its lack of ingredients list or how much of the product is “natural” (it is not advertised as “all natural”). This product, which possesses a fresh, French vanilla scent, is formulated to help prevent dryness and irritation while cleaning and conditioning fur of all types. Besides oatmeal, its formulation also includes a broad array of natural liposomes like the B-vitamin Panthenol. The shampoo lathers and rinses well and works well in thorough cleaning with less scrubbing. 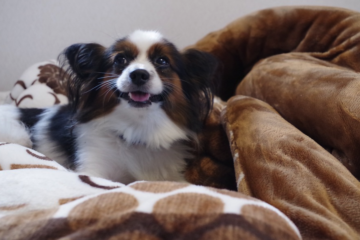 Customers have noted that it works exceptionally well to keep dogs with white fur immaculate. Besides this, we observed the formulation to help with rashes and reduce itching. Although not as potent as other dog shampoos available, the vanilla scent is noticable. One fundamental disadvantage of this product lies in its cap, which can be difficult to seal adequately.